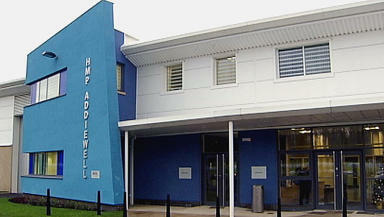 HMP Addiewell, near West Calder, housed 700 male prisoners when inspected in August. Inspectors have raised concern over staffing levels and experience at Addiewell prison. HM Chief Inspector of Prisons for Scotland Wendy Sinclair-Gieben praised the "positive and respectful" relationships between workers and inmates but said staffing at the West Lothian jail was "far from ideal". HMP Addiewell, near West Calder, is run by private company Sodexo and housed 700 male prisoners when inspected in August. It opened in 2008 and was designed as a learning prison, where inmates are given the opportunity to improve their prospects of getting a job. The range of employment and training opportunities was said to be too narrow, however, and attendance was below 50% of capacity. Inspectors welcomed positive initiatives including a partnership with Police Scotland in tackling the impact of psychoactive substances and "innovative" healthcare practices. But they noted a high number of missed appointments and that Sodexo staff did not intervene when nurses were being subjected to "verbally aggressive behaviour" on their medication rounds. They also registered concern over the length of time prisoners in Douglas B hall were locked in their cells - up to 22 hours a day. The report published on Wednesday said: "HMP Addiewell's single most enduring challenge over the past few years has been retaining staff and maintaining the agreed staffing complement. "On a number of occasions inspectors found staff with only a few months' experience being supported by staff with as little as 12 to 14 months' experience. This is a far from ideal situation." Across nine standards inspected at Addiewell, five were rated satisfactory and four generally acceptable. Several recommendations for improvement were made, including an extension of the number and type of employment opportunities available to prisoners. Ms Sinclair-Gieben said: "Overall, the prison is on the cusp of a positive future if the momentum is maintained and the matters identified in this report are addressed."